Members of the GRST Regional Management Committee pictured (from left to right): Frank Wijme (Horsefly Chamber of Commerce), Robin Fennell(Clinton Outdoor Sportsmen Association), Larry Messaros (Green Lake Snowmobile Club), Jim Kirby (Performance All-Terrain Ltd. and 100 Mile Chamber of Commerce), Steve Law (108 Resource Management), Donna Barnett (MLA, Cariboo-Chilcotin), Cheryl Chapman (Co-chair, New Pathways to Gold Society and Training and Product Development Manager, Aboriginal Tourism Association of B.C. ), Joanne Doddridge (District of 100 Mile House) and Brent Rutherford (Secretary, New Pathways to Gold Society). (100 MILE HOUSE) Local business leaders and community groups are teaming up to ensure that a Cariboo trail with a rich and colourful past continues to have a bright future. The coalition has set up a Regional Management Committee for the Gold Rush Snowmobile Trail to oversee its upgrading and long-term management. 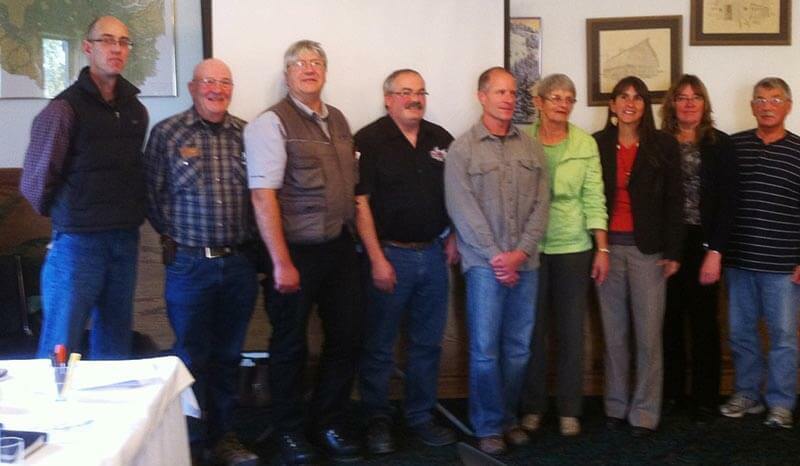 The committee plans to ensure the trail continues to be an asset to the Cariboo. “The Gold Rush Snowmobile trail represents a real economic development opportunity for the Cariboo and I am pleased to see formation of a management committee to ensure the trail achieves the real benefits it can provide for the Cariboo,” said Pat Corbett, Hills Health Ranch owner and a long-time supporter of the project. The Gold Rush Snowmobile Trail between Clinton and Wells-Barkerville was formally established in late 1990’s, but had been used for years previously by local snowmobile clubs. Sections of the trail have also been used for generations by First Nations peoples for traditional practices and trade and are still in use today. There are also portions of the Cariboo Waggon Road along the route. The popular Cariboo route received major maintenance during the winter of 2009-10 with the removal of obstructions — mostly trees killed by the mountain pine beetle epidemic. The project was organized by the New Pathways to Gold Society (NPTGS) working in partnership with many organizations, including the District of 100 Mile House, First Nations and local contractors. Over this period, approximately $600,000 was spent on the trail with funds coming from a number of sources, including the National Trails Coalition, Western Economic Diversification Canada, Northern Development Initiative Trust and a provincial government Trails Development Grant. A key goal in forming the committee is to ensure the investments made in the trail are protected and benefits accrue to the Cariboo. NPTGS Co-chair Cheryl Chapman thanked the participants for agreeing to serve on the new committee and spoke to the benefits the trail can provide to Cariboo residents. “It is critical the new committee represent the interests of all people in the Cariboo and I am confident the First Nations representatives will be major contributors to its success,” said Chapman, who is also Training and Product Development Manager for the Aboriginal Tourism Association of B.C. The Regional Management Committee was established at a meeting held Oct. 16 at the Hills Health Ranch. The first decision of the committee was to hire consultant Steve Law of 108 Mile to provide administrative support for the new Committee. “I’ve worked closely with New Pathways to Gold and the District of 100 Mile House on the recent project and am keen to assist the newly formed committee to move quickly to implement key components of a preliminary Business Plan,” said Law. The NPTGS provided assistance to an ad hoc advisory committee that has met over the last year and gives financial resources to develop a business plan that will provide direction as the new Regional Management Committee begins its work. Law says more information on the new committee and the committee members will be provided in the near future once all the details have been finalized.